Although it's much too cold to think about doing this right now, one of my favorite things to do while dining out is dining al fresco. Especially in New York, where the sights of the city and the people-watching possibilities are first-rate. If you want to throw a view of the National Debt Clock into the mix, then give Sushi Zen a try the next time you have a lunchtime craving for sushi. When I'm at a Japanese restaurant, one of my favorite rolls to order is the Shrimp Tempura Roll. At Sushi Zen, it's prepared with flying fish roe, scallion, cucumber, and kaiware sprouts. 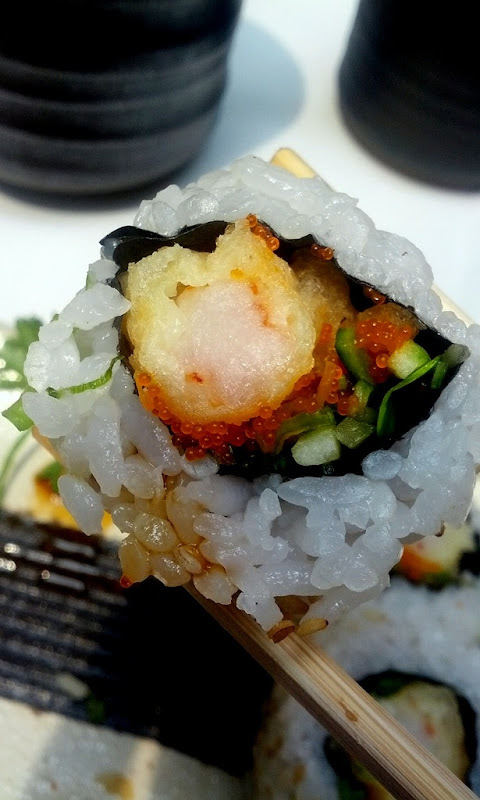 The roll ($12.50) is generous in size, yielding pieces that are packed full of flavor. The shrimp is succulent and tender despite being battered and fried beforehand, and the crispness from the scallion and the cucumber provide a nice contrast in texture. As a treat, I ordered the Soft Shell Crab Roll ($18.00). Substitute the shrimp tempura for the soft shell crab, and you have their Soft Shell Crab Roll. 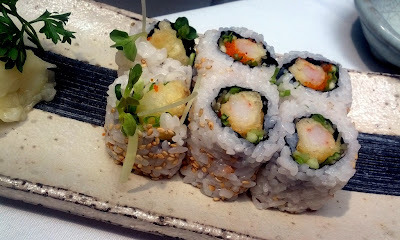 But while the Shrimp Tempura Roll was a joy to eat, the Soft Shell Crab Roll only gave me problems. The crab was plentiful, but it made for an awkward dining experience. 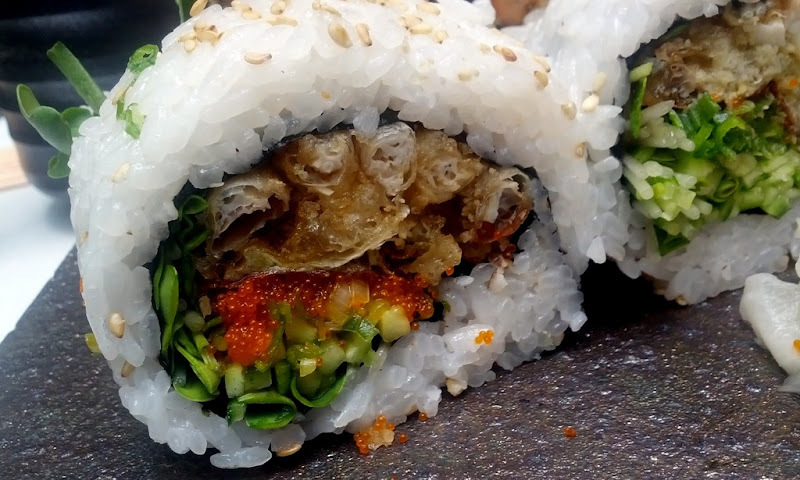 No matter how hard I tried, I couldn't put a whole piece of the Soft Shell Crab Roll into my mouth at once. Needing to take multiple bites wouldn't have been such a big deal had the inside of the roll stayed put. After biting into it, though, the contents of the roll just spilled out all over the plate. Certainly not my most graceful moment... And certainly not something I wanted to subject my fellow diners to! 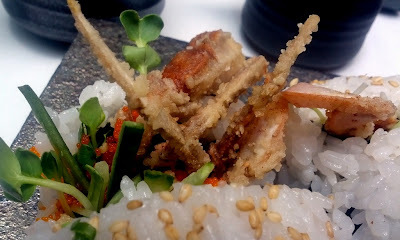 Mechanics aside, I enjoyed the flavor of the Soft Shell Crab Roll and would definitely order it again. Lunch was on the pricey side due to the seafood in my rolls, but, all in all, it was a satisfying meal. A word of caution, however... After you've paid the bill, do not take the check with you when you leave the restaurant. For whatever reason, they don't want customers walking off with it, and they will chase you down the sidewalk to retrieve the original check.